A photographer captured in Syria and imprisoned for seven months recounts his story and how he became the first American ever to escape al-Qaeda. “What is your name?” asked General Mohammad. “Matthew,” I said. I had stopped saying Matt a while ago because it means ‘dead’ in Arabic. On New Year’s Eve in 2012, Matthew Schrier was headed home from Syria, where he’d been photographing the intense combat of the country’s civil war. Just forty-five minutes from the safety of the Turkish border, he was taken prisoner by the al-Nusra Front, an organization the world would come to know as the Syrian branch of al-Qaeda. Over the next seven months he would endure torture and near starvation in six brutal terrorist prisons. He would face a daily struggle just to survive. And, eventually, he would escape. In this gripping, raw, and surprisingly funny memoir, Schrier details the horrifying and frequently surreal experience of being a slight, wisecracking Jewish guy held captive by the world’s most violent Islamic extremists. Managing to keep his heritage a secret, Schrier used humor to develop relationships with his captors—and to keep himself sane during the long months of captivity. 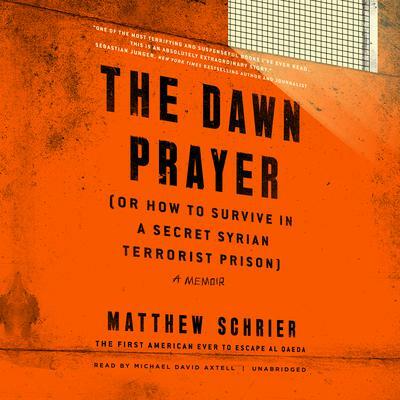 The Dawn Prayer (or How to Survive in a Secret Syrian Terrorist Prison) is a tale of patriotism and unimaginable bleakness shot through with light, of despair and friendship, sacrifice and betrayal, in a setting of bombed-out buildings and shifting alliances. It’s the story of the first Westerner to escape al-Qaeda—not a battle-hardened soldier, but an ordinary New Yorker who figured out how to set his escape plan in motion from a scene in Jurassic Park. From the prisoners’ fiercely competitive hacky sack games and volleyball tournaments (played using a ball made of shredded orange peels and a shoelace) to his own truly nail-biting breakout, Matthew Schrier’s story is unforgettable—and one you won’t want to miss. A photographer captured in Syria and imprisoned for seven months recounts his story and how he became the first American ever to escape al-Qaeda. On New Year’s Eve in 2012, Matthew Schrier was headed home from Syria, where he’d been photographing the intense combat of the country’s civil war. Just forty-five minutes from the safety of the Turkish border, he was taken prisoner by the al-Nusra Front, an organization the world would come to know as the Syrian branch of al-Qaeda. Over the next seven months he would endure torture and near starvation in six brutal terrorist prisons. He would face a daily struggle just to survive. And, eventually, he would escape. 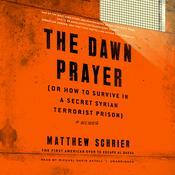 The Dawn Prayer (or How to Survive in a Secret Syrian Terrorist Prison) is a tale of patriotism and unimaginable bleakness shot through with light, of despair and friendship, sacrifice and betrayal, in a setting of bombed-out buildings and shifting alliances. It’s the story of the first Westerner to escape al-Qaeda—not a battle-hardened soldier, but an ordinary New Yorker who figured out how to set his escape plan in motion from a scene in Jurassic Park. From the prisoners’ fiercely competitive hacky sack games and volleyball tournaments (played using a ball made of shredded orange peels and a shoelace) to his own truly nail-biting breakout, Matthew Schrier’s story is unforgettable—and one you won’t want to miss. 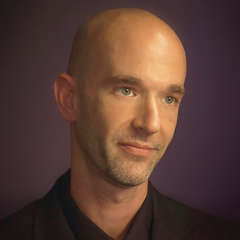 Matthew Schrier is from Deer Park, New York, and a graduate of Hofstra University, where he studied film production and English. In 2013 he became the first Westerner to ever escape from al-Qaeda. His story has been covered by 60 Minutes, the New York Times, and CNN. Since his return home, Schrier has devoted himself to working with the US military, using his experience in Syria to educate American troops about survival after capture by extremists.